Looking for the best 2018 Black Friday & Cyber Monday Canon EOS Rebel SL2 deals, sales, rebates and specials? Here is the buying guide for you! The Canon EOS Rebel SL2 (also known as the EOS 200D) is currently the most compact DSLR camera on the market and it is lightweight, fun and easy to use. The 24.2MP CMOS (APS-C) sensor and DIGIC 7 Image Processor deliver brilliantly sharp results, with Dual Pixel CMOS AF keeping your videos and photos in clear focus. In addition, the Canon EOS Rebel SL2 DSLR camera achieved an excellent 78% overall score and Silver Award from the experts at DPReview, and it is suggested for “Those seeking a portable and easy-to-use interchangeable lens camera with an optical viewfinder“. So, if you are interested, just get it this holiday shopping season! Here is a roundup of Canon EOS Rebel SL2 Holiday Deals 2018, along with Black Friday, Cyber Monday and Green Monday Canon EOS Rebel SL2 deals and sales. 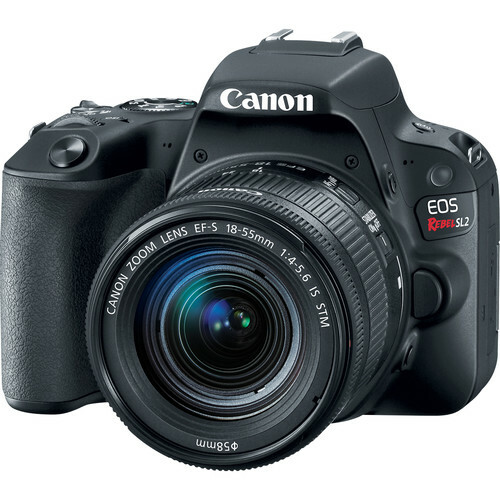 $100 off on Canon EOS Rebel SL2 Body: $449 at Amazon, B&H, Adorama. $150 off on Canon SL2 with 18-55mm Lens: $549 at Amazon, B&H, Adorama. $300 off on Canon SL2 with 18-55mm and 55-250mm Lenses: $699 at Amazon, B&H. $264 off on Canon SL2 with 18-55mm and 75-300mm Lenses: $549 at Amazon. Canon SL1 with 18-55mm and 75-300mm Lenses: $599 at Amazon.